Persian carpets are usually made of wool. The most sought after wool is called "Kush". It is long, soft and silky, and is sheared in the spring from the bellies of sheep and goats. In the Hamadan and Kurdistan region, camel hair is sometimes used. 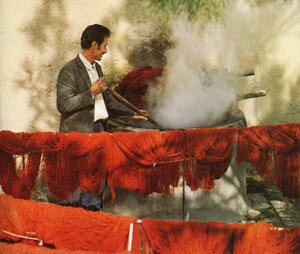 Silk is frequently employed to make very finely knotted carpets. Although silk is expensive, and does not wear as well as wool, it has the advantage of not attracting moths. 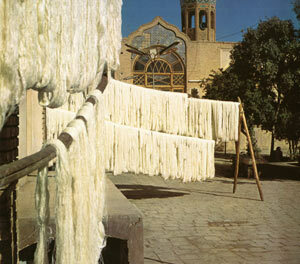 The preparation of the wool has much to do with the appearance of the final product. Proper shearing guarantees the maximum length of fibre. Then the fibres are washed, sorted, teased, fluffed and combed to be ready to be spun on a spindle or spinning wheel. After the spinning process the year can be dyed. Most rugs contain either natural or synthetic dyes. Natural dyes are made from vegetable or mineral sources. Synthetic dyes are made from either aniline or chrome. The dyes used to colour the wool are of the greatest importance in completing the effect and lengthening the life of Persian carpets. Innumerable raw materials have been used in the past for dying wool and dyers have always been greatly respected. Most of the traditional raw materials were of vegetable origin: roots, flowers, barks, and leaves. However, some animal products and various insects were also used. The popular belief that vegetable dyes in contrast to chemical dyes, do not fade, is unfounded. Yet, when vegetable dyes fade, they become softer and more attractive. In 1900, the government even forbade the use and import of chemical dyes; however, this law has never been strictly enforced. The two most common agents used for natural dye were madder for red colour (extracted from roots of 3-9 year old plants grown over the Near East and Central Asia), and indigo for blue (extracted from indigo plant imported from India. Saffron produces the brightest and also the most expensive yellow. Sumac, turmeric and pomegranate also supply various yellow dyes. Green can be made from a dying of indigo followed by a bath of yellow. The art of dyeing has had a tradition of prestige and mystery. Practically every family has its own special formula which is carefully guarded and passed on through generations. There are two basic knots used in Oriental rugs: the Ghiordes or Turkish (symmetrical), and the Senneh or Persian (asymmetrical). The Turkish knot is more sturdy than the Persian knot, but produces a less fine weave. The Turkish knot can be found in almost all village or nomad carpets in Persia. The Persian knot with very few exceptions is used only in carpets woven in the larger cities of Persia. In the Persian Knot, the wool thread forms a single turn about the warp thread. One end comes out over this thread and the other over the next warp thread. In the Turkish knot the yarn is taken twice around two adjacent warp threads and the ends are drawn out between these two threads. Professionals in the towns usually make finely knotted Persian carpets, while nomads make coarsely knotted ones. The most coarsely knotted carpets come from Kurdistan, and the finest from Kashan. There are between 65 and 330 knots per square inch in finely knotted carpets. These can come in all sizes. A nomadic weaver can tie around 8000 knots each day, and a professional weaver up to 12000 knots. Copyright © 2015 Queen Persian Carpets. All rights reserved.